Ti-Lite tactical folders evoke the sleek speed and rebellious lines of the classic 1950's-styled switchblade. Unlike most switchblades however, they are legal to carry nearly everywhere. 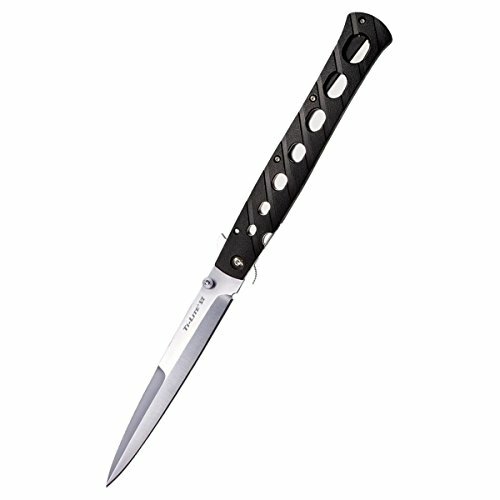 They feature Japanese made AUS 8A stainless steel blades with a bead blast finish, razor sharp edges and sturdy, needle sharp points. The CNC milled handles are forged from super tough 7075 aluminum billets and are given an attractive bead blast surface and finished with a protective EDP (electric Discharge plating) coating. And for maximum strength and safety, Cold Steel has equipped the Ti-Lites with Cold Steel patent pending, stainless steel Leaf spring locks (proven, in their tests, to hold 130 lbs). for ease of carry, the Ti-Lites come equipped with a small, but unobtrusive steel pocket clip, and can be opened rapidly by using the thumb studs or by snagging a quillon on the edge of your pocket as you draw your knife out. A solid performing Cold Steel design.